With a 400 year history, we originally started out in the service of the Shogunate in Edo, dealing in “washi” (Japanese paper) and items made from bamboo. Toward the end of the Edo Period we began handling fans with “ukiyo-e” or wood block prints depicting scenes of everyday life, at the same time managing the production end for Hiroshige and several other well-known “ukiyo-e” artists. So-named “Ibasen” prints can be seen in art museums, not only in Japan, but in the British Museum, Boston Art Museum, Metropolitan Museum of Art and many other prestigious art museums around the world. 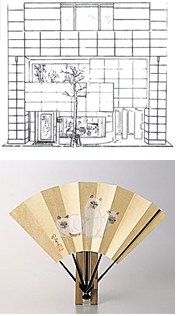 At present we deal in fans, folding fans, Japanese stationary goods and sundries, each finely-wrought item an expression of the workman’s craftsmanship. Visit our shop today for a touch of old Edo.